The proven design of the AT44PA just got better! Now featuring Hatsan's Quiet Energy Technology, enjoy all the power of the AT44 platform with 32% less shot noise. 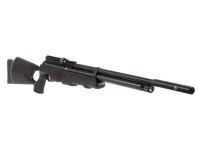 The pump action cocking and cycling mechanism makes this rifle one of the most unique guns on the market. 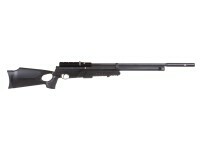 If hunting or pest elimination is your main purpose for this air gun, .22 or .25 would be the best calibers to get. Hatsan is pretty special when it comes to the airgun industry. 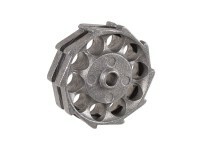 They are one of the few companies that publishes velocities with lead pellets, not those super-light alloy pellets. The pellets you're probably going to use -- lead pellets -- are the same ones they use to test their guns and provide velocities and muzzle energy. Things I liked: This air rifle is a straight up great deal. The power and accuracy of this air rifle is absolutely incredible. For such a reasonable price it is really a satisfactory rifle. I am also very fond of the trigger and firing mechanisms. This gun is outstandingly accurate, and from 50 yards with a 10x scope it can shoot dime groupings no problem. 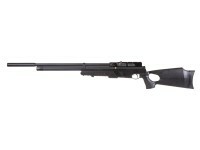 This airgun can easily taking down small game and even medium sized game with the right pellets and shot placement. I would recommend running .22 predator polymags with this gun as they worked exceptional for me. Things I would have changed: This airgun is very loud and the sound could easily be mistaken for a real fire arm, so I would advise caution when shooting. Also the plastic of this gun has a sort of hollow feel in my opinion, but that is no real problem. 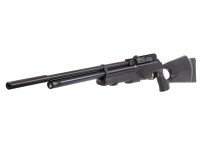 What others should know: This airgun is very loud and could possibly scare people and game. The air tank usually shoots 6 mags, so 60 accurate shots before a refill. Things I liked: The pump action is great. Thumbhole stock is comfortable to the hand. Smooth trigger right out of the box. ACCURATE! Because it is so accurate, it is loads of fun to shoot. MEGA ACCURATE! And powerful, too. Things I would have changed: It's almost as loud as a "real" .22 rifle. I don't mind, but if decible levels are a concern to you, you may want to consider one of the QE series with the built-in silencer. 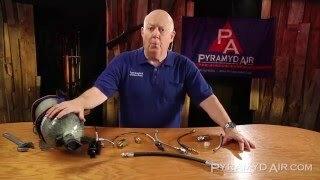 What others should know: I purchased the "10 for $10" and scope mount services from Pyramyd when I ordered my .25 AT44PA. The air cylinder arrived filled, so I was able to start shooting immediately! It was dead nuts accurate right out of the case - @ 25 yards the 3rd shot was middle of the bullseye!!! For $10, having PA go over the gun, check for leaks, and test fire it, was money well spent. Any experience level can achieve accuracy with this rifle! A full cylinder will give about 40 solid strong shots - 4 magazines worth! Get a second or third! Enjoying the best shooting using JSB Exact Kings & H&N Barracuda Extreme Hunters - they go where you want them too. And with a THWACK! H&N Barracuda & Silver Points seemed to be too big/long to allow the magazine to load into the file and cycle "cleanly". With these pellets I had a couple of "double shots". I would not recommended them... also, the Predator Polymags, when loaded into the magazine, were too long and the magazine would not load into the rifle. What others should know: this was my first PCP---I won it--I liked this Hatsan I bought 2 more a BT65 AND a AT44 QE LB--I had to put hush puppies on the PA and BT65 both have a really loud bark - but my home made hush puppies really took the bark out of these dogs--I love my Bolton lath and mill**I fill my PCP's from 3000psi scuba tanks it is cheep to fill them--$13.00 including tax here in Utah--good scopes and rings are a must for anything over 20 yrds. which I aero my PCP's at 50 yrds. and use my range finder and shot cards to tell me the number of clicks above or below from 10 out to 150 yrds. https://www.pyramydair.com/s/a/UTG_New_Generation_Reinforced_Clamp_on_Bipod/5145 something like this might work. is this 25 cal as quiet as the specs say? Now how exactly do you recharge the tank on this air rifle. can you specify more the PUMP? Does it need a pump to recharge? Can the tank be recharged like all pcp tanks? Either a high pressure tank or a hand pump can recharge the gun, just a matter of having the right adapters.